After breaking the club’s transfer record for the fourth time in 12 months, Clarets boss Sean Dyche isn’t done just yet. With just under a week to go before the deadline closes, at 11 p.m. next Thursday, Dyche remains keen to add to his squad. He completed the record signing of New Zealand international striker Chris Wood on Monday, the 25-year-old arriving for an initial £15m, rising to £18m with add ons. And Burnley have lodged a bid of £8m for Lorient forward Abdul Majeed Maris. Dyche said after the 2-0 Carabao Cup win at derby rivals Blackburn Rovers on Wednesday night: “There’s different situations. Dyche is eager to add more options to his frontline. Last week, the Clarets offered €13m for Deportivo La Coruna’s Romanian international forward Florin Andone, but with Deportivo holding out for his release clause of between €25-30m, the 24-year-old – who missed a penalty in Sunday’s 3-0 defeat to Real Madrid at the Estadio Riazor – is likely to prove too expensive. Burnley turned their attentions to Majeed Waris, relegated from Ligue 1 in France with Lorient last season. The 25-year-old has played in England previously, at Hartpury College and with the Nike Academy, and also turned out for Forest Green Rovers’ reserves. He has since gone on to play for BK Häcken in Sweden, Spartak Moscow, Valenciennes on loan, Trabzonspor and Lorient, joining for €5m two years ago. Majeed Waris was scouted by Manchester United three years ago while in Turkey. However, under the FA’s work permit regulations, with Ghana currently 50th in the FIFA world rankings, Majeed Waris has to have played 75% and above of their internationals over the last two years. That isn’t the case, so Burnley, should a deal be agreed with Lorient, would have to go to an exceptions panel, who would consider the player’s experience and value, to decide whether the player can still be allowed to join the club. The appeals process is a points-based system, and if he gets the necessary endorsement. Points are given based on the transfer fee, his wages, and experience. Meanwhile, Dyche insists there is no pressure on Wood, despite the cost to secure his signature. 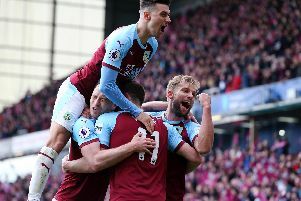 Dyche feels transfer fees are largely meaningless in the current market: “Ten years ago, people used to say: ‘He’s signed for a record fee – it must be really hard.’ Every player has a record fee now. “You ring about any player, and they go: ‘Twenty million’. Everyone’s £20m. So everyone’s got a price tag on their head. “Those days have gone. I think it’s changed. I really mean it.